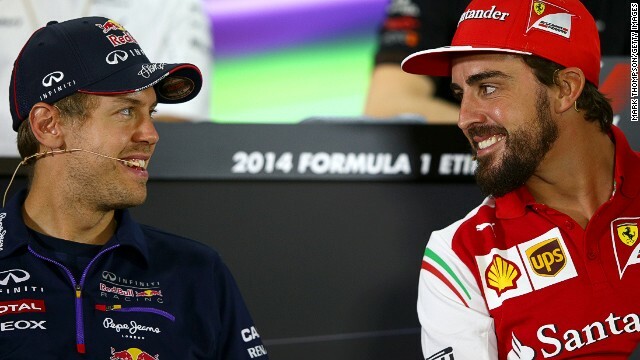 Swapping sides: Fernando Alonso (right) is leaving Ferrari but he will be replaced in 2015 by Red Bull's four-time world champion Sebastian Vettel (left). 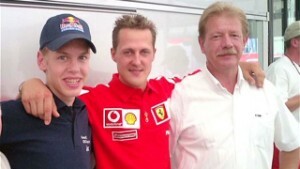 Vettel has been part of the Red Bull Racing family since he was 12 years old but, now aged 27, he said the time was right to move on after "an incredible journey." Two-time world champion Alonso is the most highly-rated driver in F1 but the 33-year-old is keeping everyone guessing about where he will drive in 2015. 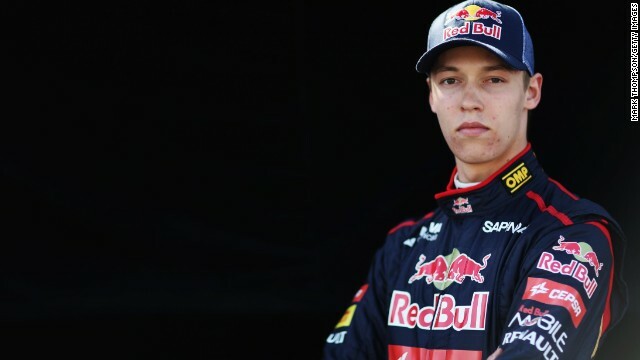 Russian Daniil Kvyat has been so impressive in his rookie season with Toro Rosso that he has the job of replacing Vettel at Red Bull next season. 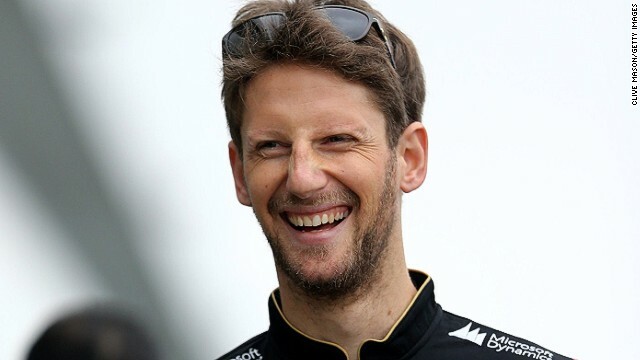 Romain Grosjean has plenty to smile about after Lotus confirmed, just ahead of the final race of 2014 in Abu Dhabi, it is retaining its driver line-up of the Frenchman and Pastor Maldonado for 2015. 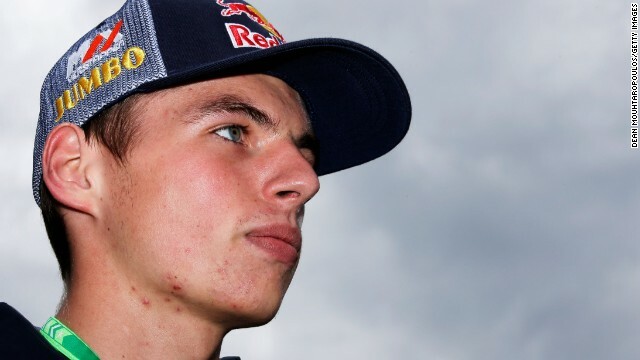 There are some new faces already signed up for 2015 including 17-year-old Max Verstappen, who will become the youngest driver in F1 history when he makes his debut with Toro Rosso. Here's another new face to look out for. 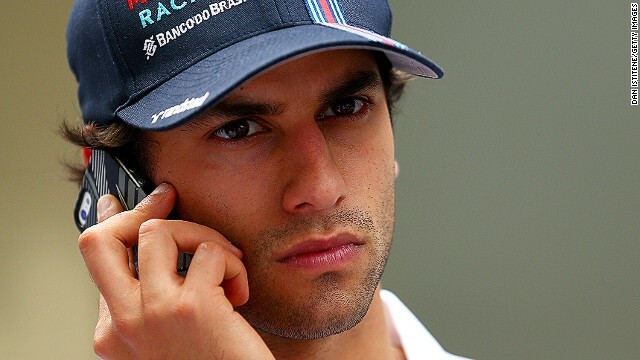 Brazilian Felipe Nasr will drive for Sauber, making his F1 debut at the age of 22. F1 merry-go-round: Who has seats in 2015? 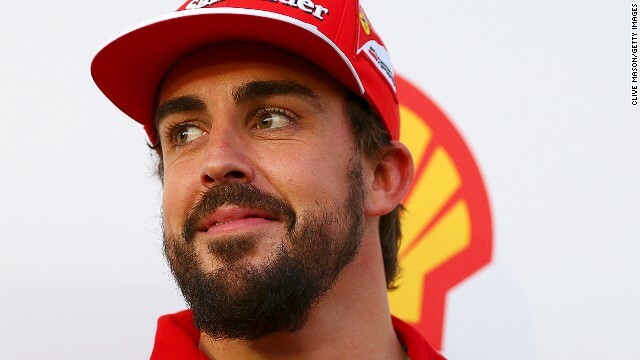 (CNN) -- The worst kept secret in Formula One is finally out -- Fernando Alonso is leaving Ferrari and will be replaced by Sebastian Vettel. Red Bull's four-time world champion has signed a three-year contract with the Scuderia, the oldest team in F1, from 2015. After ending his five-year stint at Ferrari, Alonso remains coy on where he will be driving next season. The double move by two of the sport's high profile world champions is the most significant in the driver market this season. 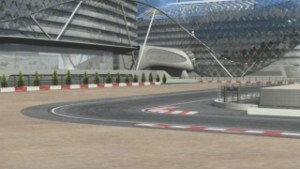 But in the fickle world of F1 there are no guarantees it will work out for either of the ambitious racers. Read: Who will be the new F1 world champion? There are still seats to be filled at McLaren, Force India and Toro Rosso. With the curtain about to fall on the 2014 season at Sunday's Abu Dhabi Grand Prix, hopeful drivers have just one more chance to stake their claim for the remaining seats. Alonso is regarded as the best all-round driver currently racing at the elite level of motorsport, a fact many of his peers are even happily willing to acknowledge. The Spaniard -- a double world champion with Renault in 2005 and 2006 -- is regarded as the key to the F1 driver market. The 33-year-old made it clear he wanted to leave Ferrari, even though he had two years left to run on his contract with the Italian team, but he has yet to confirm where he will go next. A return to McLaren seems most likely, despite his acrimonious departure from the team after just a single season as Lewis Hamilton's teammate in 2007. McLaren is about to embark on a new phase after reigniting its relationship with engine manufacturer Honda. Alonso is expected to lead this new era at McLaren, although the fiercely ambitious driver may first want guarantees that the Honda engine is going to be a success. Keeping the media guessing about his future -- and maybe his future employers too -- seems to have provided Alonso with plenty of sport off track. Speculation in the media has seen Alonso linked with buying the Lotus team, joining forces with German sports car specialists Audi and even ousting Nico Rosberg or Hamilton at Mercedes. 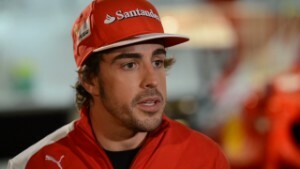 Alonso remained typically tight lipped about his future plans when he was questioned by the media at the Abu Dhabi season finale. Has Vettel made the right decision? Vettel has endured his worst season at Red Bull in 2014, failing to win a race compared to three victories for his rookie teammate Daniel Ricciardo. 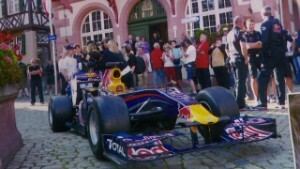 Since his full debut season for Toro Rosso in 2008, the German has won at least one race a year, not to mention winning four straight world championships between 2010 and 2013. 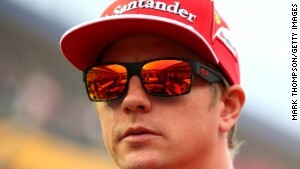 The 27-year-old is now hoping to succeed where Alonso failed at Ferrari by adding to his collection of world titles. "The next stage of my Formula One career will be spent with Ferrari and for me that means the dream of a lifetime has come true," Vettel said. "When I was a kid, Michael Schumacher in the red car was my greatest idol and now it's an incredible honor to finally get the chance to drive a Ferrari. "I am extremely motivated to help the team get back to the top. I will put my heart and soul into making it happen." Vettel will partner Kimi Raikkonen -- the last man to win a world title with Ferrari in 2007 -- in 2015 but there are no guarantees the car and its Ferrari engine will be any match for the might of Mercedes. 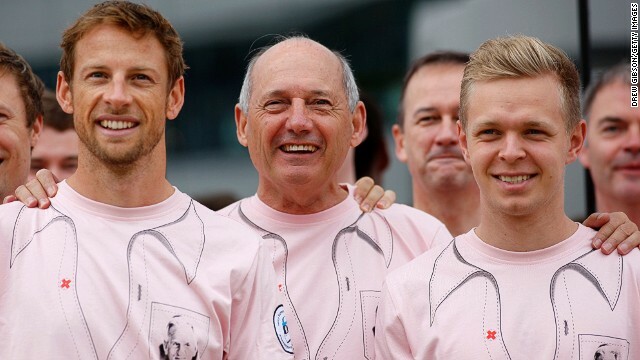 Who will drive for McLaren? McLaren has tried to dampen speculation over just who will be in its cars in 2015 in the build-up to this weekend's season-ending race. "We know you're awaiting news on our driver line-up. We'll announce after December 1 -- you'll hear it here first," the team said on Twitter. Guys, we know you're awaiting news on our driver line-up. We'll announce after Dec 1 -- you'll hear it here first. All eyes now on Abu Dhabi. Alonso remains the red-hot favorite to take one of the seats but the future of current drivers Jenson Button and Kevin Magnussen remains unclear. Button -- the 2009 world champion with Brawn Grand Prix which has since morphed into Mercedes -- has remained sanguine about his future and has even explored the idea of moving to sports car racing. Danish rookie Magnussen is fiercely passionate about staying with McLaren, the team which gave the 22-year-old his F1 debut in 2014. "There is no Plan B," the Dane told CNN when asked if had explored his options if he wasn't retained by the eight-time world champions. Which other teams have seats to fill? Mercedes, Red Bull, Ferrari, Williams, Lotus and Sauber have all confirmed their driver pairings for 2015. There are still seats on offer at McLaren, Force India and Toro Rosso. Force India has already announced it will retain German Nico Hulkenberg for 2015 but Mexican Sergio Perez has not had his position with the team confirmed. There's also only one seat up for grabs at Toro Rosso, who will blood 17-year-old Max Verstappen as the youngest F1 driver in history next season. Junior Red Bull driver Carlos Sainz Jr is in pole position for the second seat -- and the Spaniard has been named as a test driver for Red Bull at the end of season test in Abu Dhabi -- although Toro Rosso may still retain French racer Jean-Eric Vergne. Sauber announced Swede Marcus Ericsson and Brazilian Felipe Nasr as its 2015 drivers in November much to the chagrin of current driver Adrian Sutil, who believed he had a contract with the team for next season. Ericsson and Nasr are both pay drivers, backed by sponsors who bring an estimated $30m funding to the Swiss team. Grid shrinks to 18 in 2015? The F1 market may be flooded with plenty of eager racers but the number of seats has been squeezed. The financial pressures on the Caterham and Marussia teams, which both went into administration in October, means there are, in theory, only 18 spots on the F1 grid in 2015. After missing the U.S. and Brazil grands prix, Caterham has used crowdfunding to help finance a return in Abu Dhabi. Japan's Kamui Kobayashi retained his drive while the team has also handed Briton and former tester Will Stevens his F1 debut. Read: Is F1 running out of gas? Both Caterham and Marussia remain on the official entry list for the 2015 season but their future is dependent on a hard winter drumming up funding to stay in the sport. With teams spending a minimum of $70m per season, employing a driver who offers pace, performance and a pot of personal talent is more important than ever for those teams for can't afford super-talents like Alonso.